Insights Into "First Man," "BlacKkKlansman," "The Favourite," "Black Panther"
In this prequel to SHOOT’s The Road To Oscar series which starts next month, we tap into voices of experience—Academy Award winners and nominees who are now find themselves again in the awards season conversation. Here are reflections from an Academy Award-winning DP, an editor who earned an Oscar nomination for a documentary he co-directed and produced, a three-time Oscar-winning costume designer, and yet another costume designer who’s been twice nominated. They share insights, respectively, into First Man (Universal Pictures), BlacKkKlansman (Focus Features), The Favourite (Fox Searchlight), and Black Panther (Walt Disney Studios). 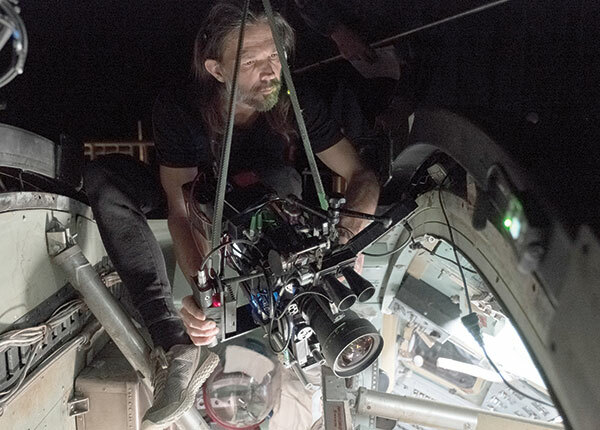 Linus Sandgren, FSF, who won an Academy Award for Best Cinematography in 2017 on the strength of Damien Chazelle’s La La Land, reunited with the director on the recently released First Man and is again very much in this awards season’s Oscar conversation. Based on the book by James R. Hansen, First Man chronicles the multi-faceted backstory of the first manned mission to the moon, focusing on Neil Armstrong and the decade leading to the historic Apollo 11 flight. A visceral and intimate account told from Armstrong’s perspective, the film explores the triumphs and the cost—on Armstrong, his family, his colleagues and the nation itself—of one of the most dangerous missions in history. For Sandgren, the allure of the project centered on getting the opportunity to not only again collaborate with Chazelle but also to take on a cinematic adventure dramatically different from La La Land. “From one film to the next, it’s a complete U-turn in terms of style,” shared Sandgren. “For this (First Man) we explored cinema verite, documentary style, filmmakers from the 1960s and ‘70s. Damien and I looked into perhaps finding a way to make it feel like this film was made back during that time. Damien wanted it to be very authentic, like you were with the astronauts in the space craft—and just as importantly to experience the realism of the Armstrong family behind the scenes. Capturing this range necessitated a mix of Aaton cameras for super 16 and 35mm—models made for documentary filmmakers to run around with, often deploying a smaller zoom lens that works really well for handheld. VistaVision cameras were selected for the miniatures unit, and of course large format IMAX cameras. Underscoring Chazelle’s realistic bent and aspirations for First Man, Sandgren noted that the director wanted to avoid a CG, green screen feel. “We didn’t do a single green screen shot,” affirmed the DP. Sandgren’s filmography extends beyond his lauded collaborations with Chazelle. The DP also, for example, lensed American Hustle and Joy for director David O. Russell, and Battle of the Sexes, which tells the story behind the historic Billie Jean King/Bobby Riggs tennis match, for the directorial team of Jonathan Dayton and Valerie Faris. The Dayton/Faris duo, who take on commercials and branded content via production house Bob Industries, gravitated to Sandgren for Battle of the Sexes based on his work for them lensing select spots over the years. Barry Alexander Brown is a filmmaking talent whose work spans editing as well as directing—but as the subject of a film, he leaves something to be desired. Their latest collaboration is the critically acclaimed BlacKkKlansman, which received a six-minute standing ovation after its world premiere screening at this year’s Cannes Film Festival. It adds to a shared filmography which has seen Brown edit such Lee features as Do The Right Thing, School Daze, Oldboy, Inside Man, Summer of Sam, Crooklyn and Malcolm X.
BlacKkKlansman takes us back to the early 1970s to tell the true story of Ron Stallworth (portrayed by John David Washington) who becomes the first African-American detective on the Colorado Springs Police Department, but his arrival is greeted with skepticism and open hostility by the department’s rank and file. Undaunted, Stallworth resolves to make a name for himself and a difference in his community. He sets out on a dangerous pursuit—to infiltrate and expose the Ku Klux Klan. Posing as a racist extremist, Stallworth contacts the group and soon finds himself invited into its inner circle. He even cultivates a relationship over the phone with the Klan’s Grand Wizard, David Duke (Topher Grace), who praises Stallworth’s commitment to the advancement of White America. With the undercover investigation growing ever more complex, detective colleague Flip Zimmerman (Adam Driver) poses as Stallworth in face-to-face meetings with members of hate group, gaining insider’s knowledge of a deadly plot. Together, Stallworth and Zimmerman successfully take on the organization which aims to sanitize its violent rhetoric to appeal to the mainstream. For Brown, BlacKkKlansman provided myriad challenges—and tremendous gratification. He cited the juxtaposition of two scenes to make one sequence—Harry Belafonte recounting for a contemporary audience a white mob’s brutalization of a young black man in Texas in 1915, interspersed with the current movie storyline which takes us to a KKK dinner where members are being inducted into the Klan, the families beaming with pride and celebratory joy. “The challenge was to constantly weave in and out yet create an emotional feeling like it’s one thing—not two disparate, unrelated events. Tying the two together carried an emotional resonance,” observed Brown. Another prime challenge for Brown was bringing into the movie’s fabric news footage from last year’s Charlottesville, Virginia tragedy in which white supremacists and Nazis marched, their hate meeting resistance and then yielding the murder of 32-year-old civil rights protester Heather Heyer. Two Virginia State Patrol troopers—Lt. H. Jay Cullen, 48, and Berke M.M. Bates, 40—were also killed in a helicopter crash while trying to advance public safety efforts. The news footage also contained part of the now infamous reaction of President Trump who at a press conference talked of “good people” marching in step with the Nazis and KKK members. Editor Brown brings impressive directing credentials to Son of the South. He, for example, co-directed with Glenn Silber The War At Home. As producers of that film, Brown and Silber earned a Best Feature Documentary Oscar nomination in 1980. Winner of three Academy Awards for her work on The Young Victoria for director Jean-Marc Vallee, The Aviator for Martin Scorsese, and Shakespeare in Love for John Madden, costume designer Sandy Powell has also been nominated nine other times for her work on Carol, Cinderella, Orlando, The Wings of the Dove, Velvet Goldmine, Gangs of New York, Mrs. Henderson Presents, The Tempest, and Hugo. Powell has teamed numerous times with director Neil Jordan on such films as The Crying Game, Interview With A Vampire, Michael Collins, The Butcher Boy and The End of The Affair. Other frequent collaborators include directors Derek Jarman and Scorsese. Powell costume designed Jarman’s Caravaggio, The Last Of England, Edward II and Wittgenstein. For Scorsese, Powell recently wrapped her seventh feature, The Irishman, having previously worked on The Wolf of Wall Street, Shutter Island, The Departed, The Aviator, Gangs of New York, and Hugo. Powell now finds herself again being talked up in terms of Oscar prospects, this time for The Favourite, a feature which marks her first collaboration with director Yorgos Lanthimos. The Favourite takes us to the early 18th century. England is at war with the French. Nevertheless, duck racing, pineapple eating and other offbeat indulgences are thriving with people of wealth. A frail Queen Anne (Olivia Colman) occupies the throne and her close friend Lady Sarah Churchill (Rachel Weisz) governs the country in her stead while tending to Anne’s ill health and mercurial temper. When a new servant Abigail Masham (Emma Stone) arrives, her charm endears her to Sarah. Sarah takes Abigail under her wing and Abigail sees a chance at a return to her aristocratic roots. As the politics of war become quite time consuming for Sarah, Abigail steps into the breach to fill in as the Queen’s companion. Their budding friendship gives Abagail a chance to fulfill her ambitions and she will not let anyone or anything stand in her way. The politicians in the story are defined in part by their colors—the Tories in red and the Whigs in blue. But Powell dressed them all in black and they just wore waistcoats in either the blue or the red. Still, there was research involved. For example, the shape and silhouette of the Queen’s robes of state while addressing Parliament are based on period portraits—yet Powell infused that garb with details that were stylized and marked by her own whimsy. The Favourite is slated to hit theaters in late November. Powell also recently wrapped work on director Rob Marshall’s Mary Poppins Returns which is scheduled for release on December 19. A two-time Oscar nominee—for Malcolm X in 1993 and Amistad in 1998—costume designer Ruth Carter is now again front and center in Academy Awards speculation—based on her contributions to Black Panther, the breakout hit directed by Ryan Coogler. Having never done a superhero movie before and needing a crash course in the Marvel universe of characters, Carter was taken out of her comfort zone. But Carter gained a measure of that comfort back from Coogler, whom she worked with for the first time. Carter’s triumphs have been realized in a still growing body of work which over the years includes Steven Spielberg’s Amistad, the reincarnation of the Roots miniseries, which earned her a primetime Emmy nomination in 2016, and Ava DuVernay’s Selma. The latter garnered Carter a Costume Designers Guild Award nomination in 2015 for Excellence in a Period Film. Sound Insights Into "Black Panther," "Roma"
Lensing "A Star Is Born"; The Delicate Balancing Act Of "Free Solo"